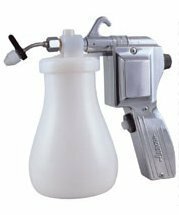 The CM-11A Spot Cleaning Guns are self-pressurized. The operation is quite simple and convenient and works best with general cleaning liquid or solvents. The screw-button at the back side of the gun is used to control the pressure of the spray; turning to the left is strong and to the right is weak. Using the "weak" is particularly important when dealing with lighter, finer and woven fabrics. Equipped with Adjustable Direction Spray Nozzle.